Learn to discover and develop your CliftonStrengths in academics, career and beyond. StrengthsQuest is Gallup's groundbreaking 2002 book that has helped generations of college students and learners of all ages discover and understand their talents. 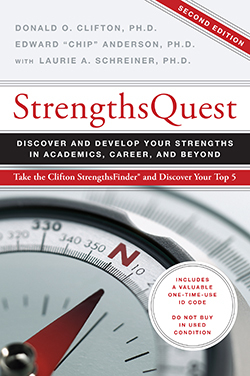 Written by Don Clifton, the Father of Strengths Psychology and Inventor of CliftonStrengths, and Edward "Chip" Anderson, StrengthsQuest helps students make the most of what they naturally do best. College students, in particular, are at a critical phase in life. They are discovering who they are and their place in the world. They want meaningful experiences and relationships. Often, students have never even considered what they are naturally good at -- or the possibility of using their innate talents in every aspect of their lives. With StrengthsQuest, students get an access code to complete the CliftonStrengths online talent assessment. Empowered by their personalized assessment results and the book's advice, students use StrengthsQuest to discover and develop their unique blend of talents to achieve academic, career and personal excellence. "We grow and develop most when we are working on and working with our talents and strengths. Our greatest potential for growth toward excellence is found in our talents and strengths." StrengthsQuest challenges students to apply their talents for success not only in school, but on projects, with teams and in leadership. StrengthsQuest includes one access code to take the CliftonStrengths online talent assessment. Gallup has partnered with over 600 college campuses to create strengths-based programs. Develop Engaged & Thriving Students Using CliftonStrengths for Students. Are you a campus leader looking to engage, energize and retain students? Complete the form below to learn how to bring the transformative power of a strengths-based learning environment to your school. A Gallup expert will contact you. How many people are you interested in using CliftonStrengths with? Since 2015, confidence in higher education has decreased significantly, while affordability has simultaneously affected perceptions of the industry.